Are you a multitasker, trying to save time by talking on your mobile phone while driving? You might soon have to pay a fine of up to Rs 10,000. The government wants to increase the penalty for this (Rs 100-300 at present) -- to Rs 4,000 for a first violation; Rs 6,000 the second time; and then Rs 10,000, in addition to licence suspension for a month and a compulsory training, thereafter. Similarly, you might have to shell out Rs 15,000 or face a six-month licence suspension, if you are caught driving under the influence of alcohol. This offence currently attracts a penalty of Rs 3,000 or imprisonment of up to three years. For not wearing your seat belt while driving, you might have to pay a fine of Rs 5,000 and it will also give you two ‘demerit points’. The proposed Road Transport and Safety Bill, likely to be cleared by the Union Cabinet next week and introduced in Parliament in its current session, seeks to make Indian roads safer by imposing hefty penalties for violation of traffic rules. It also proposes introducing a penalty-point system, like in developed countries, under which 12 demerit points against a driver (on repeat offences) leads to suspension of licence for a year. For instance, if a driver exceeds the stipulated speed limit by 9 km per hour, he gets one demerit point. The proposed rules, though stringent, could prove beneficial in reducing consumers’ harassment by police personnel. The Bill seeks to introduce contact-free enforcement — relying on electronic surveillance for offences like over-speeding and use of mobile phones while driving — in all cities with population of more than one million. So, on getting emails about traffic rule violations, offenders could pay penalties online. Also proposed is earmarking of speed limits for all roads across the country. Among many other changes that the Bill proposes, there is also a step to remove RTO (regional transport office) officials' human discretion and the touts' role, through introduction of automated driving licence tests. This is meant to fundamentally revamp the country's RTOs. 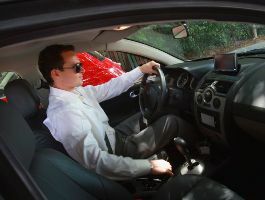 Drivers, like passport applicants under the new system, could apply online for licences and automatically get appointment dates for medical and road tests. Also, the test will take place in an adaptive driving range (a system already in use in 18 districts of Gujarat), with various barriers and restrictions on the test track, and with electronic sensors to generate performance-based scores immediately. The Bill also proposes to introduce a unified biometric licensing system to ensure a person has only one licence. For checking 'roadworthiness' of vehicles, the proposed Bill wants to introduce a mandatory fitness test for cars and two-wheelers after five years of registration. This test could be taken anywhere in the country, so the owners will not have to take the pain of taking their vehicles to the state where those were registered. Also, transfer of vehicles from one state to another is sought to be facilitated online. For the first time, the Bill has also incorporated provisions for children's safety by fixing the accountability of adults when the road user is a child. Data show that children's fatality rate in road accidents is 28 per cent. So, stringent punishments have been proposed - dangerous driving with a child on board could lead to a six-month suspension of licence, imprisonment of 15 days and a fine of Rs 15,000. And, in the event of a child's death in a road accident, the driver will land seven years in prison and have to pay Rs 300,000 in fine. The Bill also wants close scrutiny on automobile manufacturers. It proposes setting up of a national authority with powers to order recall of motor vehicles where a defect could cause harm, or which do not follow the standards for safety laid down in law. This body is to also have the powers to lay down regulations for safety assessment tests -- such as crash tests, for which there are no common guidelines at present - and make the information public. Currently, vehicle makers registered with the Society of Indian Automobile Manufactures have since 2012 been following a voluntary recall policy that gives the company concerned discretionary powers for recall. Many Indian manufacturers' cars for the domestic market have failed European agencies' crash tests, while their vehicles for other markets have easily passed those. To ensure a breach of these regulations costs the company concerned dear, a fine of Rs 5 lakh has been proposed for each vehicle that fails the test. Also, for the first time, vehicle spare parts will require conformity certificates, so that spurious products could be avoided. The proposed law gives citizens the right to go to court if faulty design of roads leads to accidents. The Bill also regulates insurance and compensation in the case of accidents: It incorporates setting up of a motor accident fund to provide compulsory insurance cover, setting up of a Motor Accident Claims tribunal to settle claims for compensation and provide cashless treatment for victims of all accidents during the 'Golden Hour' (15 to 60 minutes of an accident).